NYAPRS Note: Just out: a team from the Human Services Research Institute, Boston College School of Social Work, and the University of Maryland School of Public Health has released research they conducted on self-direction with groups of state and local mental health program directors associated with the National Association of State Mental Health Program Directors and the National Association of County Behavioral Health and Developmental Disabilities Directors. Under this model, “individuals who use publicly funded mental-health services, and who have an interest in selecting their recovery supports, develop a person-centered plan and make use of a flexible budget to purchase goods and services to meet their long-term health and wellness goals.”The respondents concurred about the potential for self-direction to improve systems through “the introduction of new market dynamics through enhanced participant choice and spoke of its potential to rebalance services and supports from costly and undesirable inpatient and emergency interventions to community-based services and supports.” They also endorsed the critical value of choice and self-determination and underscored the important role that peer-run agencies can play. Comments: Giving control and choice to recovering people to purchase the goods and services they need to advance their health, recovery and lives in the community has long been a very high priority for NYAPRS, which is why I recently agreed to chair the Mental Health Self-Direction National Advisory Committee. Data from peer supported self-direction programs has shown that people often use these funds to advance their wellness (joining health clubs), health (making use of alternative methods of treatment and getting dental care) and employability (computers and routers to apply for jobs; assistance with resume prep and benefits advisement and new clothing to prepare for interviews; access to transportation (mass transit passes) to get to and from work. New York State is becoming a leader in this area since self-direction is one of our approved Medicaid Home and Community Based Services that is currently being piloted in 2 areas and is slated to come online for all HCBS enrollees in the coming year or so. What do mental health program directors around the nation think of self-direction, and what do they see as likely to help or hinder its adoption? Self-direction is emerging as a promising model of service delivery for people with serious mental health conditions, and one that aligns with the federal focus on individualized, person-driven care to effect recovery. Under the model, individuals who use publicly funded mental-health services, and who have an interest in selecting their recovery supports, develop a person-centered plan and make use of a flexible budget to purchase goods and services to meet their long-term health and wellness goals. But what impact will self-direction have on the mental health system in general, and how do state and county program directors view it? We conducted an exploratory survey (n = 46) and interviews (n = 17) with program directors to find out. Self-Direction marks a paradigm shift from existing service system arrangements, shifting control over public resources to individual participants rather than reimbursing traditional providers for services they render. Mental health program directors hold a pivotal role in self-direction’s adoption and implementation, so we wanted to gauge their interest and understand their views on this emerging practice. The Study. Working with two national organizations representing state and county mental health directors, we offered an informational webinar on self-direction to mental-health program directors. All 84 attendees (representing 35 states and DC) were invited to take an online survey immediately after the webinar. Of the 46 survey respondents, 29 agreed to a follow-up interview with our research team. In total, 17 interviewees were successfully contacted and interviewed. Results. A strong majority (87%) expect self-direction to have either a high or moderate impact on the mental health system in coming years. Three-quarters indicated self-direction as either a high or moderate priority for their agency, and over three-quarters associate self-direction with such benefits as stronger service user choice and voice, greater flexibility, enhanced recovery, increased community integration, and improved service quality. When asked to rate factors that will help facilitate self-direction, nearly all respondents (98%) rated its emphasis on self-determination and recovery as important; 42% rated service user interest/demand as important, and 40% rated its cost-effectiveness as important. When asked to indicate barriers to the adoption of self-direction, 54% rated “less control for providers” as a challenge, and 32% rated “less control for payers” as a challenge. Discussion. Respondents pointed to the potential for self-direction to improve systems through the introduction of new market dynamics through enhanced participant choice. They spoke of its potential to rebalance services and supports from costly and undesirable inpatient and emergency interventions to community-based services and supports. However, interviewees were unclear to what extent these benefits might be realized because self- direction has yet to be taken to scale in a mental health context. Additionally, the availability of recovery- oriented services and potential cultural barriers such as doubt about the choice- making capacity of persons with serious mental health conditions could impede adoption. To successfully implement self- direction, leadership will likely need to build the capacity for appropriate services and supports and implement training to challenge perceptions about participant capacity for choice and recovery. Peer-run organizations and enhancing the visibility and role of people with lived experience in the mental health system may support the success of these efforts. Conclusions. Adoption and successful implementation of self-direction appears to hinge on several important facilitators. First, findings suggest self-direction is most likely to take root in a system that is sufficiently recovery-oriented—with a well-developed peer support workforce and a robust network of community-based supports for housing, employment, and community inclusion. Strong leadership—particularly among policymakers, advocates, and administrators who can act as change agents for self-direction—is also important. Clear and actionable implementation guidance is critical. Finally, effective communication of outcomes research paired with personal stories that bring data to life will promote the adoption and ongoing support for mental health self-direction. o Mental health program directors are interested in implementing self-direction and have high expectations for its impact on systems and individuals. o Successful implementation hinges on several key factors: a true recovery orientation, effective grassroots advocacy, strong leadership, implementation support, and the ability to clearly communicate its outcomes. For more information. See Croft, B., Simon-Rusinowitz, L., Loughlin, D., and Mahoney, K. “Mental health leadership perspectives on self-direction,” published online in the journal Social Work in Mental Health on December 4, 2017. Available at: https://doi.org/10.1080/15332985.2017.1395783. Or contact the first author. Bevin Croft (bcroft@hsri.org) is a research associate on our Behavioral Health team. Our 2018 Seminar program will have a special focus on strategies to provide aid and support to people with the most extensive and ongoing mental health, substance use and medical challenges. These aims have become top priorities in New York and also at the federal level, with the recent launch of the Interdepartmental Serious Mental illness Coordinating Committee (ISMICC). Look for more program details in the coming weeks! NYAPRS is very pleased to welcome Denise Ranaghan as our new Director for Peer Services and Elena Kravitz as our new Director for Policy and Public Engagement. Elena Kravitz CPRP is a native of Brooklyn who comes to us after a decade of highly acclaimed service as a leader, advocate and peer services manager in New Jersey while working for Collaborative Support Programs of NJ. During her tenure there, Elena was well known for her extraordinary commitment, courage, compassion and passion to advancing wellness, recovery and self-determination and her talent for networking and forging alliances with disparate individuals and organizations. Her special areas of focus include peer support, criminal justice, WRAP facilitation, cultural competence and disability rights. Most recently, Elena's advocacy strengths have taken her to the national stage, where she is the sole grassroots peer representative to serve on the new federal Interdepartmental Serious Mental Illness Coordinating Committee. Denise Ranaghan, LMHC, CPRP also shares a powerful personal recovery story that has driven her 17 year record of service in our field and has taken her serving as a peer specialist on the MHA in Ulster County’s ACT team to become its director. She has also served as a residential manager, employment specialist and IPRT coordinator. In her role as Director of Wellness Services at the MHA, Denise initiated multiple projects that collaborated with community organizations to bring mental health and substance use related issues into public discussions. She is a certified WRAP facilitator who has both helped to start and support self-help groups and has made numerous presentations on trauma informed care, voice hearing and cultural diversity. Denise is also the author of "Institutional-Eyes," which profiled her experience in the military. Please join me in welcoming Denise and Elena to NYAPRS. New York health care leaders, lawmakers and even a prominent late-night talk show host recently warned Congress that unprecedented political brinksmanship is threatening health coverage for millions of children. The national uproar involves the Children’s Health Insurance Program. It provides subsidized health care for children in families with incomes that are too high to qualify for Medicaid but are under 200 percent of the poverty level — or $40,840 for a family of three. The Republican-led Congress missed the Sept. 30 deadline to fully fund the 20-year-old Children’s Health Insurance Program, or CHIP. Its funding nationally requires approximately $15 billion, with New York's funding about just over $1 billion, according to a report by the Henry Kaiser Family Foundation. Roughly 9 million U.S. children are enrolled in CHIP, including 350,000 in New York. Community leaders gathered this week in Westchester County to urge Congress to fund the program before the Christmas recess, according to Congresswoman Nita Lowey, D-Harrison. “As states begin to exhaust their federal CHIP funding, leaving millions of children at risk of losing health coverage, congressional Republicans are plowing ahead with a $1.5 trillion tax bill instead of reauthorizing the program,” Lowey’s office said. She said New York expects to exhaust its CHIP money in early 2018. Talk show host Jimmy Kimmel and his son, Billy, both charmed Kimmel's viewers recently while calling for action on CHIP funding, which has historically enjoyed bipartisan support, USA TODAY reported. Billy arrived in April with a serious congenital heart defect that required surgery immediately after his birth to repair a blocked pulmonary valve. He recently had a successful second surgery and Kimmel took a small hiatus from his late-night show. "Daddy cries on TV, but Billy doesn’t — it’s unbelievable," Kimmel added before thanking the staff at Children's Hospital and talking about CHIP. Another nationwide health program for mostly uninsured, homeless and poor Americans is similarly at risk of losing federal funding. The Community Health Centers Fund relies on millions of federal dollars but Congress has yet to reauthorize the money for coming years. The Open Door Family Medical Centers sites in Westchester and Putnam counties are at risk of losing $4.2 million if the community health center money runs dry. Open Door has five sites in Westchester: Port Chester, Ossining, Sleepy Hollow, Mount Kisco and Mamaroneck. It also has a site in Brewster in Putnam County. The Open Door sites have about 55,000 patients overall, and as many as 5,000 in Westchester would be affected by the federal funding cuts, health center officials said. The issue threatens health care provided to nearly 2 million New Yorkers at 65 health centers, according to the National Association of Community Health Centers. NYAPRS Note: The Nassau Queens PPS (Performing Provider System) has released the following announcement regarding a new partnership with NYAPRS to make Peer Bridger services available to frequent users of St. John's Hospital in Far Rockaway. Building on our history of demonstrating the effectiveness of peer bridger services in a variety of service settings including state hospitals, health home like initiatives and with managed care members in NYC, we're very pleased to be launching this pilot in a community hospital. ROCKAWAY, N.Y.,Dec. 19, 2017/PRNewswire/ -- Catholic Health Services ofLong Island'sSt. John's Episcopal Hospital — a partner of the Nassau Queens Performing Provider System (NQP)— and the New York Association of Psychiatric Services (NYAPRS) announce a partnership to improve behavioral health patient outcomes in the Rockaways through the Peer Bridger Program. The program is set to reduce emergency department visits and re-hospitalizations and contributes to NQP's mission of improving the health of residents in the medically underserved communities of the Rockaways. Through the program, individuals with behavioral health conditions who are admitted toSt. John'sand have histories of frequent emergency department visits and hospital re-admissions will be matched with a trained andNew York State-certified NYAPRS Peer Bridger who is stationed on-site at the hospital. The Peer Bridger is someone who has personally gone through a recovery process and draws from shared experience to offer personalized support to individuals and guide them on a path to wellness and recovery. The Bridger is an expert at forming trusted relationships that are based on promoting hope and support for an effective recovery. These alliances begin at the point of hospital admission and continue for an average of six months, throughout an individual's hospital stay and after discharge into their community. "Among other benefits, the Peer Bridger Program helps us ensure that people are making follow-up appointments and going to them once they are discharged," saysMary Emerton, LCSW, DSRIP project manager, behavioral health, Catholic Health Services ofLong Island. "We need to be sure that individuals are staying on top of their health so that they remain in the community and do not need to go back to the hospital for re-admission." It is expected that the Peer Bridger will work with 70 St. John's patients per year. "In the past, people were told that mental health and addiction-related relapses were inevitable and that they would never be able to live and work independently," saidHarvey Rosenthal, NYAPRS executive director. "Our approach seeks to raise the bar for what people can expect from themselves and their mental health and addiction recovery services. Since 1995, NYAPRS' model has helped thousands of people develop the hope, knowledge, skills and support to succeed in their home communities." The program is made possible through the NYSDOH Delivery System Reform Incentive Payment (DSRIP) program — a program designed with the primary goal of reducing avoidable hospital use by 25 percent by the year 2020. The Nassau Queens Performing Provider System (NQP) is one of 25 Performing Provider Systems inNew York State. NQP is led by NuHealth/Nassau University Medical Center, in alliance with Northwell Health's Long Island Jewish Medical Center and Catholic Health Services ofLong Island, and consists of more than 8,400 partner organizations that have come together to better serve the health needs of the community through the DSRIP program. Our goal is to redesign the way health care is delivered to people with Medicaid in our community by closing critical gaps in the continuum of care and reducing avoidable hospital use by 25 percent by 2020. NYAPRS Note: The NYS Office of Mental Health has released guidance and corresponding attestation forms to community providers about the implementation of the cost of living adjustment that was a part of last year’s budget agreement, comprising a total of 6.5% direct care and direct support staff and 3.5% for clinical staff. This was one of NYAPRS’ top advocacy priorities last year and we worked in coalition with a broad array of colleague groups to get this approved. The 2017-18 Enacted Budget included funding for salary and salary-related fringe benefit increases related to changes in the State-mandated minimum wage and workforce COLAs for direct care, direct support and clinical titles. Effective January 1, 2018, the Budget included a direct care COLA increase of 3.25% for staff in CFR titles series 100 (Direct Care) and 200 (Direct Support). Effective April 1, 2018, an additional 3.25% will be added to CFR titles series 100 (Direct Care) and 200 (Direct Support), and a new increase of 3.25% t title series 300 (Clinical). Increases were calculated using CFR data and an average salary-related fringe benefit rate of 15.5%. Increases were applied based on programmatic and regional funding methodologies. A requirement of the statute is that each provider must submit an attestation confirming that the increase will be used solely to support salary and salary related fringe benefit increases. OMH has developed and attached two attestations (one related to minimum wage and one for workforce COLA) to be completed and returned to OMH within 120 days of the receipt of this letter. Failure to submit this form will result in the recovery of increases already paid, and withhold of future payment of such funds. Note that a provider may receive funding increases through multiple sources (via county contract, through state aid letter or a direct contract with OMH as well as through Medicaid revenue) depending upon each provider's array of OMH programs. Each provider will be required to submit both attestations. Please contact your local field office if you have any questions regarding these increases. As a very proud board member of the Bazelon Center for Mental Health Law, I’d like to urge you to support their historic efforts on behalf of our national mental health community! We are currently faced with the most pressing challenges in our lifetimes, with attacks on what we hold most dear coming at us almost every day. We are not only besieged with endless efforts to undo the advances of the last decade, we are now faced with protecting advances that go back to President Johnson’s Great Society and President Roosevelt’s New Deal! The Bazelon Center has been at the center of social, service, legal and rights reforms for decades and we can’t let them falter now! Like many of us, the Center is facing very challenging times and we need to support their extraordinary team, mission and record of achievement. So…please read the message below and give today. A year ago, we could not even have imagined what the year would bring. For people concerned with mental health issues, disaster has felt like a real possibility – and, due to the ongoing attack on health care, entitlements and rights and protections, it still does. For those of us who make charitable contributions at the end of the year, this year we really have to make them count. I want you to know that the Bazelon Center for Mental Health Law has been on the front lines, standing between us and disaster, and can only continue to do so with your help. We must ensure that the Center is able to address the key issues of our day. We need the Bazelon Center’s continued leadership to protect access to healthcare, be it Medicaid without onerous work requirements or Medicare. The assault is not going to stop any time soon. We must support the Center’s historic commitment and success to advancing the rights of people with psychiatric disabilities to live in the most integrated community settings. We have to ensure that the Bazelon Center can continue to keep fighting and winning the case for high educational standards for children with behavioral or developmental disabilities. Bazelon has been protecting and advancing the civil rights of people with mental disabilities for 45 years. Prisons and jails are not the place for people with serious mental illnesses: Bazelon is helping communities to take on these injustices head on. Bazelon’s message is: We want to ensure that people with psychiatric disabilities get full opportunities to move beyond dead end programs and to have the dignity and opportunity to work. 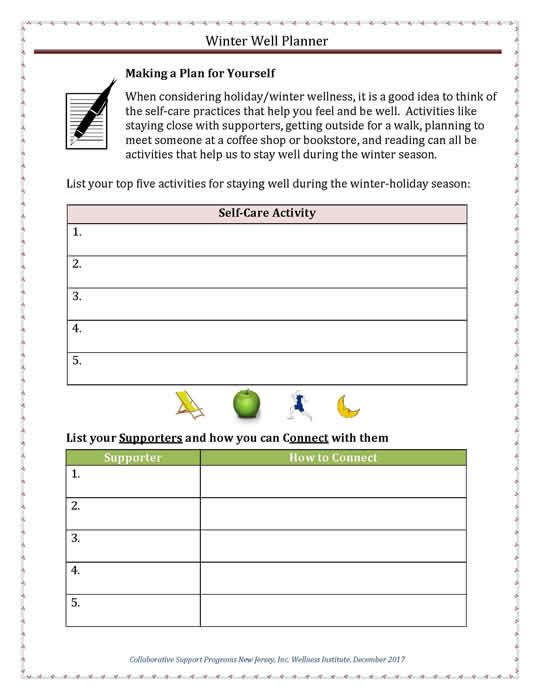 Here’s a warm winter bundle of inspiration and guidance from wellness pioneers Peggy Swarbrick and Pat Nemec and Collaborative Support Programs of New Jersey. Happy holidays all! 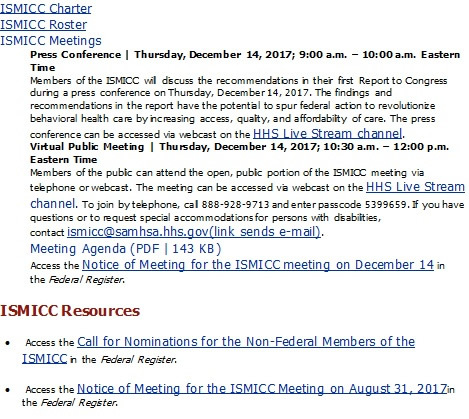 NYAPRS Note: After several months of review and discussion, the first report of the new federal Interdepartmental Serious Mental Illness Coordination Committee will be released today, at a 9am news conference and a 10:30 live meeting (see links below). The ISMICC was created under last year’s 21st Century Cures Act and, under the direction of the new HHS Assistant Secretary for Mental Health and Substance Use Dr. Elinore McCance-Katz, is charged with developing a blueprint for the Administration’s cross agency behavioral health policies that, according to their release, has “the potential to spur federal action to revolutionize behavioral health care by increasing access, quality, and affordability of care.” The report will represent our first look at what new and/or different steps SAMHSA and other federal agencies will be taking in the coming year.